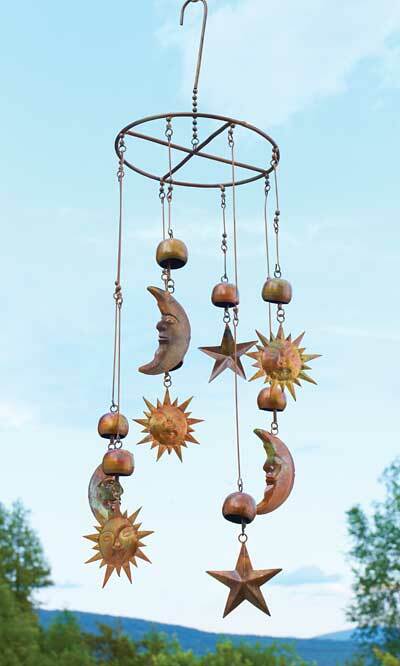 Enhance your yard with brilliant style using this Ancient Graffiti Flamed Copper Colored Sun, Moon, and Stars Mobile. This striking piece lends moving sculpture to your garden or home, along with a familiar motif thanks to the crescent moon, raised star, and sunface adornments. Each of these accents hangs from a sturdy, 8" diameter ring, and a top hook suspends the unit from a branch or other hanger in moments. Varied lengths on the metal rods holding each adornment create a spiraling shape on the piece, and a small dome above each accent lends more curves to the unit. Its copper and brown tones mesh with the outdoors, and the all metal construction is great for use in the home or yard. Bring a celestial motif to your garden or deck using this Flamed Copper Colored Sun, Moon, and Stars Mobile.